Hello everybody! Sorry I haven’t been blogging much this last week I had the flu 😦 But know Im back on my feet and back on my computer! 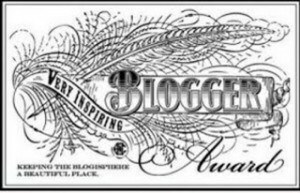 So while I was sick I was notified that I got nominated for a third time for the very inspiring blogger award!! Everytime I get nominated I feel so blessed and thankful for this honor! This time I got nominated by Lindsay she is a great inspiration her self and I would recommend checking out her blog by clinking her name above! ‹ PreviousDo your friends Define you? The flu stopped you? Pshh…You swear like the flu is some crazy illness that has killed people recently.